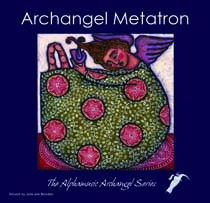 As the king of angels Metatron links humanity and the Divine. Some say he is the heavenly scribe, both creator and librarian of the Akashic records. The angel of divine connection and universal harmony, Metatron is architect of sacred geometry and sits with Shekinah at the top of the Jewish ‘Kabbalah’ tree of life. Together, their purpose is to ‘join’ the complementary male and female energies, creating a balanced Universe. As we strive to balance our own internal masculine/feminine energies to create our own balanced life so we also help balance the Universe. Creating a balanced life is not easy, choosing this angel suggests that in some way your life is out of balance either because you are not in tune with your spirituality or you are temporarily stationery on your journey searching for love. Metatron will help connect you to the source and you can ask his assistance in attracting your life partner, thus helping you find happiness through true love and creating the bridge to higher self. He reminds us of the journey through the tree of life back to the divine energy within us all. He also is said to represent judgement. So we can ask him to help us let go of judging ourselves and others.